News stories of the Ukraine omit any mention of the country’s Roma people, as though the global corporate media as well would exclude them from existence. The group’s conditions of life show a severely oppressed people, which isn’t “news” because the Roma are so deeply persecuted throughout Europe. 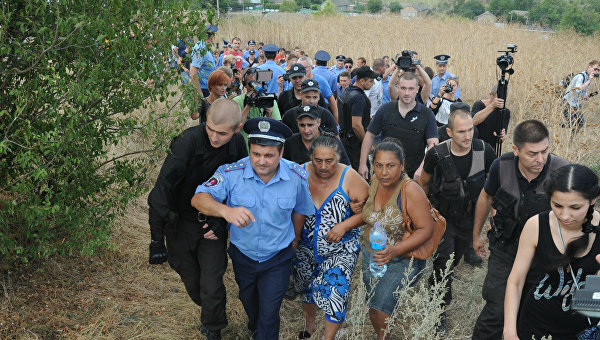 According to the “Joint Submission to the [UN] Human Rights Council at the 28th Session of the Universal Periodic Review,” Ukrainian Roma often live isolated in settlements called “tabor”, and because of at-home births, birth certificates are lacking. This deprives the children of citizenship which is theirs under law but only gained through costly court procedures. It is one more way the people are marginalised, denied State benefits, subjected to detention etc. Acquiring citizenship is the current focus of Roma efforts toward having any rights at all. (Note 1 and 2 ). This norm suggests extreme trouble for all Ukrainian minorities. Historically Ukrainian nationalism has a propensity for divesting the Ukraine of groups other than nationalist Ukrainians. The Ukraine is in contention with Russia over Crimea and Eastern regions: a large number of Russian-speaking Ukrainians believe the Ukraine wishes to make them second class citizens, “others,” or foreigners. Authorities replace Russian street names with the names of Ukraine’s nationalist heroes best known for the massacres of Jews and Poles. The country’s Association of Holocaust Survivors notes an easing of the government’s habitual anti-Semitism as the current target of hatred is being shifted toward Russians instead. 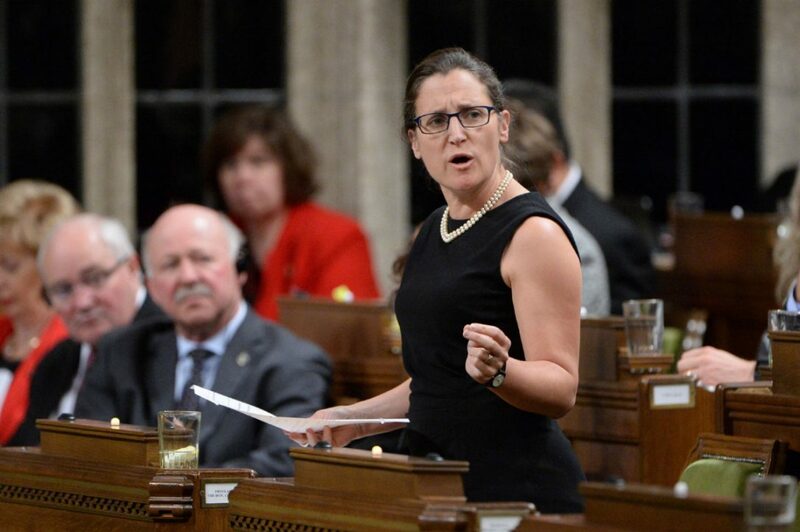 Canada’s Ukrainian oriented Foreign Minister Chrystia Freeland has announced Canada’s support for “sanctioning” (ie. punishing) Russian officials declared guilty of human rights violations. This would involve a law allowing Canada to confiscate any assets and property available, of sanctioned officials. Fortunately Russia has not threatened to reciprocate. The possibility of reciprocation for human rights violations in the ongoing systemic genocidal practices against aboriginal peoples seems beyond the grasp of Canadian politicians. The web site Dances with Bears reports Foreign Minister Freeland’s recent encounter with her Russian counterpart where she addresses him in Russian and he answers with the news that Ukraine is drafting a law to make Ukrainian the single and official language of the Ukraine. This would violate the rights of Russian speaking citizens and Polish speaking citizens as well. What if Canada decided to outlaw the use of French? Or Quebec allowed only French? North America’s lack of concern for Nazi influences among the Ukraine’s leadership is powered by the usefulness of the Ukraine as a foil for Russia and as an excuse to encircle Russia. But NATO’s tactical use of the Ukraine for its anti-Russian campaign is mixed with contempt, as suggested by the U.S. / Ukrainian pact to build a nuclear waste dump, the Central Spent Fuel Storage Facility, at the site of the Ukraine’s Chernobyl. Reports continue of threats and extreme anti-Semitism in high places. This is particularly frightening in the Ukraine which has proven itself historically to be very “hands-on”. One is reminded that in WWII one of four Jews murdered in the Holocaust was Ukrainian. Most Ukrainian Jews were murdered within the Ukraine instead of being sent to less personal extermination practices of labour camps and concentration camps. In the Ukraine the horrific stories from a very few survivors directly involve the local citizenry and militias. The threats to the Jewish population from those close to power who are either consciously or through the training of their childhoods immersed in a Nazi ideology, seem primitive, personal, unchecked, and are increasingly in need of the State’s damage control. Aware of anti-Semitism as an impediment to Euro-American support the Ukraine has an overtly Jewish Prime Minister who has met with his Israeli counterpart to improve the Ukraine’s defence and security establishments. The cosmetics are challenged by torchlight parades and utterances that might be considered surreal in another country. The Jewish Chronicle reports that Vasily Vovk, a retired general in the country’s security services has announced on Facebook (a post since deleted) that Jews aren’t Ukrainians and he intends to destroy them. As for ‘people of colour ‘ in the Ukraine, news footage insists there aren’t any. Recently a student from Zimbabwe, a star soccer player, received a fracture in his ankle while playing for his Ukrainian university team. Despite the lack of an 800 dollar fee for the operation it was preformed but while recovering, to everyone’s puzzlement he died and the parents paid ten thousand dollars to have his body returned to Zimbabwe. Since Zimbabwe has no embassy in the Ukraine the parents remain without any explanation of why their son died. A problem with Ukrainian nationalism which is whetted by anti-Russian interests globally, is that its heroes were so often complicit in the Third Reich’s crimes. Substantial evidence is presented (Press for Conversion) that Canada’s Foreign Minister Chrystie Freeland has hidden the Ukrainian Nazi collaboration within her family: the difficulty is in the norms developed through community and childhood. Is she likely to represent Canada’s and sanity’s interests in dealing with a Nuclear Russia increasingly bear-baited by neo-conservative governments? “Sporting hero’ dies in ankle op: Zim student in mystery Ukraine death,” Nqobile Tshili, May 15, 2017, The Chronicle.